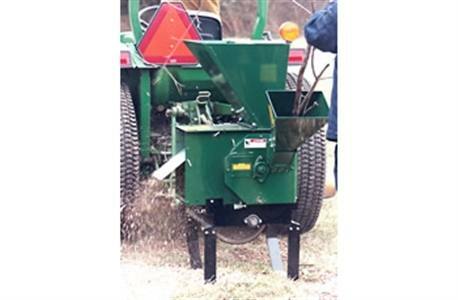 MacKissic offers two three point hitch(TPH) shredder-chippers. 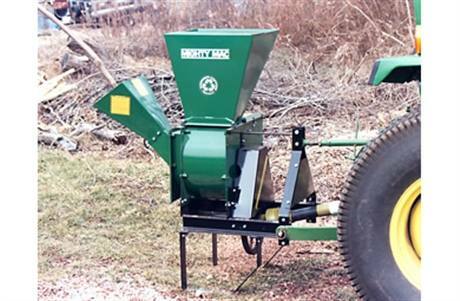 These hammermill shredder-chippers are easily attached to most category "0" or "1" tractors. Once attached, these machines can handle just about anything you need shredded. Twigs and leaves and small branches even green and soggy material, these three point hitch shredder-chippers will pulverize, shred, and mulch the organic material. The TPH122 can chip up to a 3-1/2 inch thick branch or tree, while the TPH184 will chip up to a 4-1/2 inch branch or tree! These machines will produce clean, crisp little wood chips that are perfect for garden mulching and a professional looking landscape. The TPH122 and the TPH184 are built with 12- gauge and 7-gauge steel respectively. These tough machines will process material just about as fast as the operator can feed material into the machine. For storage the TPH122 and the TPH184 are supported by three inch channel style skids. Chipper Hopper Opening: 13 in. x 9 in. Chipper Hopper Throat: 5 in. x 4-3/4 in. Flywheel Size: 14 in. x 3/4 in. Flywheel/Rotor Weight (lbs. ): 71 lb. Shredder Hopper Opening: 20 in. x 17-3/4 in. Shredder Hopper Throat: 13-1/4 in. x 7 in. Rotor Weight (lbs. ): 39 lb. Storage Space (L x Wheelbase x H): 51 in. x 28 in. x 52 in.